The little one wanted to make something for a 3 year old friend’s birthday, so we whipped up some handmade crayons and a gift tag to accompany them. Learn from our mistakes – join us for a quick recap and a laugh. When I told her we could gift handmade crayons for a friend of hers, I regretted it 2 seconds after it was out of my mouth. I will admit it, I was scared. I am a klutz in the kitchen and I really like my hands burn-free. I had visions of tripping while holding the pan full of scar-inducing hot wax, sending it splashing all over the place. Since you’re here now and we totally want you to come back when we post awesome new tutorials, we invite you to sign up for our once-weekly email newsletter. It features fun stuff from Ruffles and Rain Boots, but also includes great content we are inspired by from around the web. And one of the best parts is that all of our newsletter friends gain access to a super-secret, members-only section of Ruffles and Rain Boots! Take your creativity to the next level and sign up for our newsletter. Conquering my own fear of melting like the wicked witch of the west, I enlisted the little one’s help in peeling the paper remnants from the crayons. Lesson learned #1: if the paper is glued on, move on. The little one would pull off the majority of the paper, but I ended up using a paring knife to cut off the paper that was glued to the crayon. A little wax lost, a lot of frustration saved. Step 2: Chop the crayons. 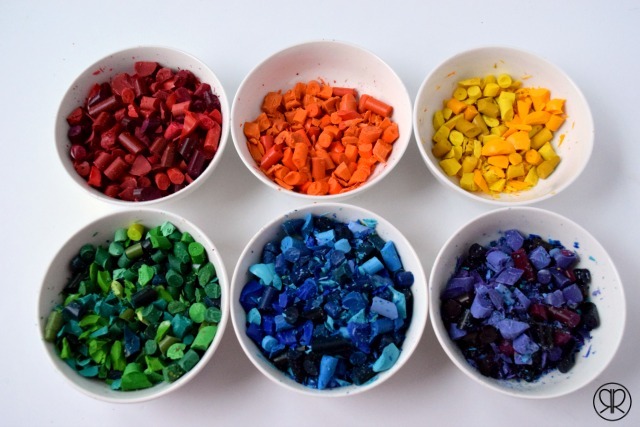 Chop the crayon remnants into small pieces (about a half of an inch) and preheat the oven to 300 degrees Fahrenheit. We were using our mini muffin tins that we use for all of our crafts, so we needed smaller pieces of crayons so that none would hang over the edge of the cavities. 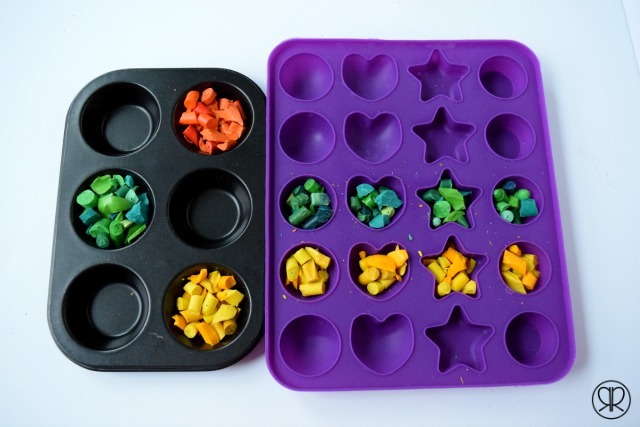 We also made some in a shaped cake pan, and I’d really recommend that for handmade crayons for the younger set. Lesson learned #2: chop the crayon remnants into smaller pieces when the little one is faking her way through ‘nap time.’ You would have thought I was water boarding her favorite stuffed animal with the wails she let out when I chopped up the pink crayons. Tip: join in and scream, too. It’s a great stress reliever. Step 3: Load up the muffin tin. Let the three year old spend 45 minutes choosing the perfect crayon pieces to add to the muffin tin. Lesson learned #3: just do it yourself when they aren’t looking. This whole project would have taken 30 minutes and not hours if the crayon whisperer wasn’t involved. Cook the crayons for about 20 minutes, checking after 15. No lessons learned here – this part was actually the easiest bit. 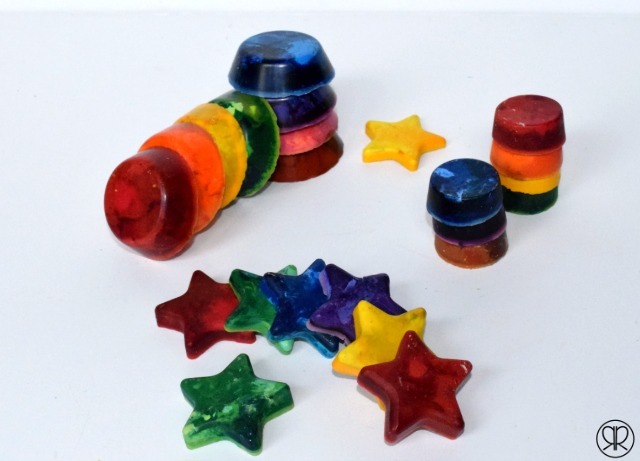 Before you remove them from the oven, make sure all of the crayon pieces have melted. Let the crayons cool. This was the most excruciating 30 minutes of my daughter’s existence, apparently. After they’ve cooled in the pan, dump them out onto a wire rack for another excruciating 30 minutes (or more) for them to completely set. Keep lifting up your children to show them that the crayons are a) still there and b) not ready yet. Lesson learned #4: consider this your strength training for the day or do this craft after dinner so that they will go to sleep and magically awake with prêt à l’emploi (ready-to-use) crayons. We checked on them more than 30 times in 30 minutes, which as you can imagine got real old, real fast when you’re lifting 30 pounds up to the counter each time. Elise chose her favorite ones to gift and keep (she’s three, not enlightened). I made a free printable bag topper and she helped me staple it on a party favor cello bag. Lesson learned #5: don’t use the cheap crayons or make them in another batch. I noticed that the ones that came in our various coloring kits didn’t work as well as those that were Crayola. Next time, I don’t think I’ll mix them together. This was a great discussion activity about heat, wax, displacement, and reuse. It turned out that my fears of this project turning into a hot mess were just needless worrying after all. Here’s a handy-dandy image in case you’d like to share this to a “Crafting with Kids” board on Pinterest. Elise absolutely loves her crayons, the heart-shaped ones are her favorite. If you’re looking for more ideas, go ahead and sign up to receive our free once-weekly newsletter. Sarah these are great! They look like so much fun! I’m definitely pinning them for when my baby gets old enough to know not to eat them. The Crayon Whisperer, ha ha ha ha ha! Been there done that with projects with my son. I am glad you stuck with it and made a lovely present. That’s a great idea! I’ll have to try making these with my daughter. Come join the Mix It Up Friday blog link up tomorrow morning. Pam@over50feeling40 invites you to read Tamera Beardsley: An I MATTER Woman; a Jewelry Giveaway and the Blog Hop! This is so creative and cute. I will have to do this with my kids. You com up with the best ideas! Aw, thanks so much, Jordan. We were actually coloring with them today! This looks so fun! What a great activity to do with kiddos. I might make these for my toddler because they’d be a lot easier to hold onto! Thanks for sharing! You’re so right, Amanda – they are the perfect size for toddler and preschool hands. Elise has actually started shading with these crayons because it’s so easy to lay them flat. Jenny invites you to read Still Baby Brain? Thanks so much – the label has been quite a popular download today. 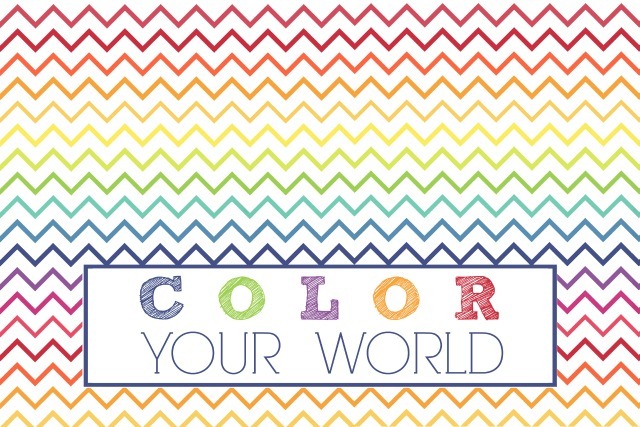 :) In my humble opinion, all of the wonderful shades of color in a single crayon are what make these so much fun. It’s like a bit of a surprise every time you color! 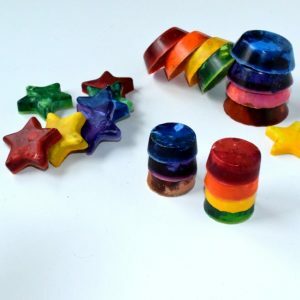 I love homemade crayons but I never have the patience to make them. I once thought I could get my kids to peel off all the paper for me… would they?! No. LOL – the one time I WANT them to peel the paper off, they won’t. Maybe I’ll give it a shot some other time. I love the shaped ones! Haha – So true, Jennifer! When you ask them to do something, it always goes the opposite way… I’ll send my little one your way and all of those pesky labels will be off in no time! Coming over from the Brag About It link party. Thank you for linking up! This is such a great way to use up smaller pieces of crayons that the kids refuse to color with any longer. 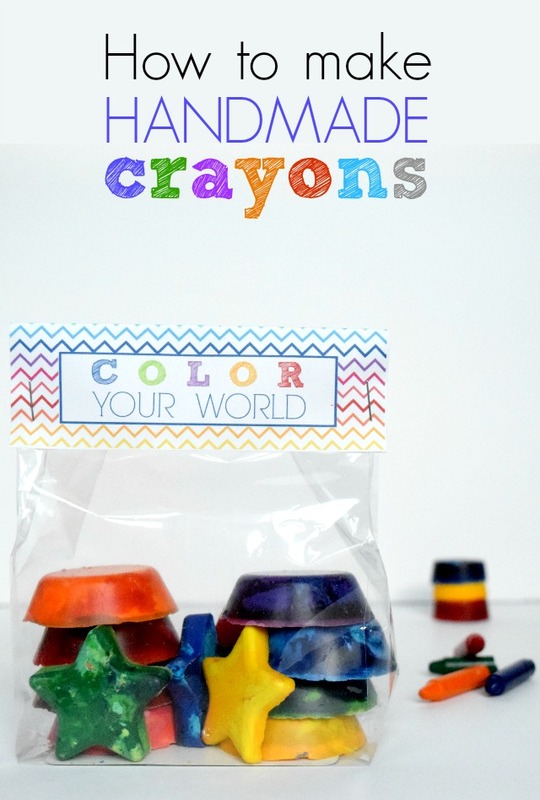 So I can see how the crayon whisperer would make this project much longer, but can I say how I am blown away with how easy it is to make these?! I always thought there was like some dark magic involved in doing this, but just melt them in cool shapes and voila!! That is awesome. I am totally going to make these. Don’t know though if my crayon whisperer would let me break apart the pink ones as well and for sure would start squealing as we broke the purple crayons! I might need to work on my strength training in preparation so I can lift multiple little people up to the counter. The crayon whisperer! That’s epic! Hey pink is a really great color! :D I love the crayons! OMG!!!! I am so impressed! I just thought melting a bit of the end and making a “painting” was so beyond cool … THIS is cool. That’s actually something I want to try, Gigi. I’m waiting until the little one isn’t so bothered by the hair dryer before I give it a go, but I would love to see what she would do with that. Hahaha, I love this! These turned out great! I am totally going to do this with our broken crayon bucket! 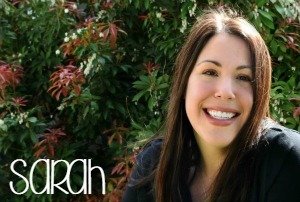 You are so amazing Sarah, I don’t know how you do it but I so wished I live near you. Madison would have a field day at your house. This I’m going to try but I’m going to have to get me a silicone or cheap tin that I don’t mind messing up. Me too, Amanda! Can you think of the fun (aka trouble) we’d get into if we were closer? :) You definitely want to go to the thrift (or dollar) store for an old tin or mold – I’ve seen some adorable shapes lately!